A dental implant is a small titanium screw that serves as the replacement for the root portion of a missing natural tooth. Dental implants can be placed in either the upper or lower jaws. Due to the biocompatible properties of titanium, a dental implant fuses with the bone and becomes a good anchor for the replacement tooth. Dental implants can be used as solutions for replacing single or multiple missing teeth. Without the root structure of a natural tooth present, the jawbone can shrink. This shrinkage can make your face look older than it is and more importantly if in the future you want an implant, there may not be sufficient bone to place one. Anyone who is missing one or more teeth due to gum disease, tooth decay or injury may be a candidate for dental implants. The determining factor is the amount of available bone. Your dentist is the best person to evaluate whether dental implants are a viable solution for you. The conventional process can take from three to six months. First, the dentist places the dental implant, which is left for three to six months to heal and integrate with the jawbone. 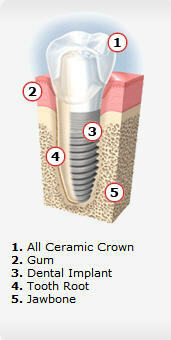 During the healing period, your may be given a temporary prosthesis until the permanent crown is put in place.